Celebs are dying off by the handfulls. I never cared for Michael Jackson. I understand he's recognized as the 'King of Pop', but pop is not usually my thing. I do believe he was one effed up individual, and that the allegations were true. He will not be missed by me. On the other hand, Farrah Fawcett was HOT. She will be missed by me. There was also David Carradine, Dom Deluise, Ed McMahon, and a few others I can't think of now. A bad time to be a celebrity, I guess. --What's the difference between Michael Jackson and a plastic grocery sack? One is white, plastic and dangerous for your kids to play with and the other carries your groceries. --Farrah Fawcett and Michael Jackson died on the same day, which is something of a coincidence. One played with Majors, the other played with minors. --News report: Unfortunately, determining a cause of death will be a long and lengthy process that could take weeks.......good news however, the embalming process appears to have been done prior to death. -- When Farrah Fawcett died God told her she had one wish, she wished for all the children in the world to be safe, so God killed Michael Jackson. Well, it was a productive weekend here. I got some projects done and some ready to go. We also got to see some of the family. On Saturday we got to see my grandmotherW unexpectedly, and I had already made plans to see my grandmotherL next weekend. Coincidence? Hmm. On Sunday we had my in-laws over for Father's Day. My wife did all the prep and things turned out wonderful, as usual. My wife is just great with food. All that watching the Food Network has its advantages. Anyway, the family all seem well and generally happy. The nephews sure are, um, rambunctious, shall we say. There's now a soon to be family member at these gatherings. I like him, he may be someone to hang with at future get-togethers. We'll see, I guess. Enough rambling, I'm tired. My project at work this week keeps me running, but I noticed I hadn't posted recently. I know my favorite blogs were the ones I could check every day and find something new. That won't happen here, this is more of a public journal for myself and those who may like to know if I actually did fall off the face of the earth. I'm quite private, except, now, for this site. Repeat first sentence of paragraph. I had my tire slashed early this morning. We are not happy to say the least. I had to take a day off work to file a police report and get it fixed. I have my theories, actually we're 99.9% sure who it was, but I can't say since there is no proof. Very ticked off. I'm actually proud of my restraint. This blog isn't about work. I haven't yet and probably won't ever talk about it here. However I have told some people at work about this blog, 4 now, actually. Mostly they were curious about the house. Now, I just wanted to share a cute video with 'K.' I tried to send it to her over the weekend, but she was unable to receive it. So now here it is for the world, or my little corner of it, anyway. It's short, funny and I hope you enjoy. Btw, yes, the lawn got mowed today. Well, the lawn isn't getting mowed today. It was last mowed exactly 2 weeks ago. It needs it, but not that urgently. 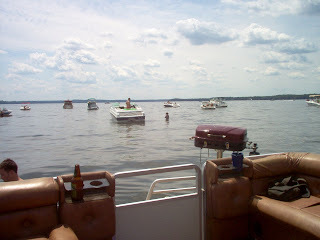 Instead I ran errands this morning and we spent all afternoon on my wife's BFF's boat. Early on we parked and grilled brats and corn in a cove I've only heard referred to as the 'party cove'. 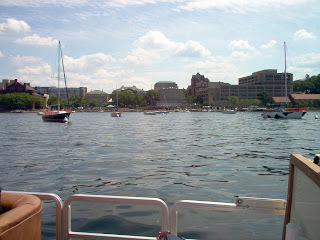 It's a nice place to put the anchor down and fire up the grill. I'm sure you know enough to click on the pic for the large version. Our camera is several years old, and these pictures show that its not the best, but at least I'm taking more pictures now! Hello, sorry I haven't posted all week. Things haven't been terribly busy, just haven't found the time and/or amibition to write much. There's always some sort of project that I should be doing instead. We finally have a handle on our trash. The little old lady who lived here before us had 35 gallon (city provided) containers for trash (weekly) and recycleables (bi-weekly). So I had to get a hold of the city to upsize to the 65 gallon containers. I finally got to use the hose for the first time to clean out the old ones. The city actually showed up within a day to get them, and it took them about 10 days to finally pick up the carpet we ripped out a couple weeks ago, so I was happy. I stopped at Farm and Fleet thursday and got ladder stand-offs so now I guess I'll have to do the gutters soon as well. Installed it on the ladder this morning and it works really well. I need to do a little work on the gutters too, so I didn't want the ladder resting on them. While I was in the garage I put up alot of nails to hang stuff. The garage really seems to have filled up fast lately, but organization helps alot. I made another trip to F&F this morning to get some wood and c-clamps. The cat did not take moving the catbox downstairs very well. I'll leave it at that. So I built kind of a steps shelf and clamped it down. 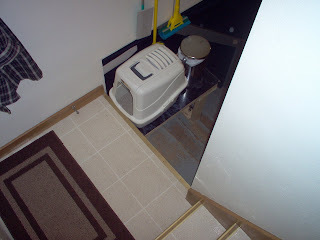 I think it will work well, it keeps the catbox out of the way of the door and we can still walk down beside it. My idea is to move it down a step a week or so, until the stupid cat gets the idea. We'll see, I guess. Edit: Actually, I went to F&F on friday, not thursday. And this morning it was Menards I shopped at instead. I don't know where my head was. Happy Monday! Yeah, well, okay. Not much to talk about today. I've been making my to-do list for house and yard. Although there is alot to be done, none of it is terribly major. For several projects I need to buy something to do it properly, though, so things WILL get prioritized somewhat. That may be a future blogpost. In the meantime, I rediscovered this recently. I don't know who the band is or what the name of the song is, it just had the filename hippy_music. It's really kind of a neat video. Take a few moments and see what you think. 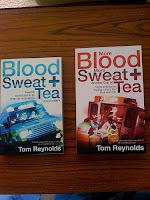 I have been reading Tom Reynolds' blog for several years now, it's one of the first blogs I followed. He is an ambulance driver in London, and has just released his second book. I haven't read it yet myself, but I have read the first and enjoyed it as much as the blog. In fact most of it came from his blog. This one I expect to be newer material and just as well told. I recommend, but to each their own. And check out Random Reality in my links on the right. Monday we had the tree trimmed. 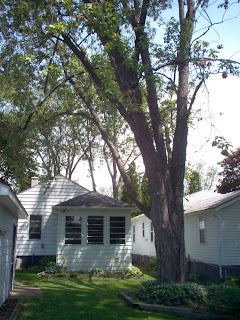 I hated to do it, but as the homeowners we are responsible for the tree and all that falls from it. Besides the branch that was hanging out over my neighbors roof, there were some broken branches and dead limbs to get rid of. 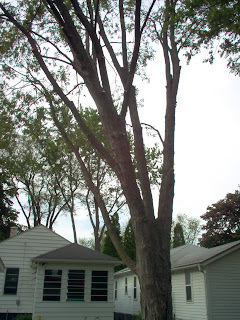 It is a Silver Maple that I would guess is about 5o feet high or so. I have more pics but its not that exciting, actually. My wife seems to be enjoying her time off. She has been doing things daily, but no rush, no worries. She deserves it. I wish I could take a week off, as well, but I'll survive. My beautiful wife picked some of our lovely flowers today. And I caught a quiet moment of her reading on our front stoop. Mrs. Scoakat has the week off to settle us into the house. Most of which is already done, so this should be a nice relaxing time for her. I have tried to get her to post here as well, but she's content to leave it to me.